A Tory peer who criticised Boris Johnson for his comments about Muslim women wearing burkas says he has been subjected to abusive emails and calls. 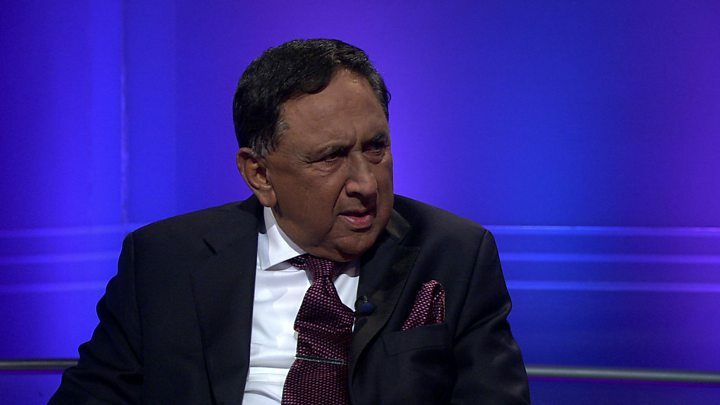 Conservative Muslim Forum founder Lord Sheikh told BBC Newsnight he received “vile” Islamophobic messages after calling for Mr Johnson to be sacked. The ex-foreign secretary had said people in burkas looked like “letter boxes” or “bank robbers”. Elsewhere, comedian Rowan Atkinson said it had been a “pretty good” joke. In a letter to the Times newspaper, Atkinson expressed support for Mr Johnson, saying said “no apology is required” for ridiculing religion. Meanwhile, the party has received dozens of complaints about Mr Johnson’s comments, which he made in a Daily Telegraph column – where he was also arguing against a ban on full-face veils. Mr Johnson is now facing a possible investigation into breaches of the Conservative Party code of conduct. Lord Sheikh said earlier this week that Mr Johnson should be kicked out of the party for his remarks. He told Newsnight that in his view, Mr Johnson had “let the genie out of the bottle” by inflaming tensions with his comments. And he said that of the 75 emails he had received about the issue, 15 were complimentary while the rest included “offensive language” and “horrible things, obscene things, about the Prophet Muhammad”. The complaints to the Conservative Party against Mr Johnson will be looked at by an independent panel. It could refer him to the party’s board, which has the power to expel him. But Blackadder and Mr Bean creator Atkinson told the Times: “I do think that Boris Johnson’s joke about wearers of the burka resembling letterboxes is a pretty good one. He has previously campaigned against legislation that made it an offence to incite religious hatred on the basis it could stifle freedom of speech. And ex-Tory Chief Whip Andrew Mitchell said Mr Johnson should not have to apologise. He said Mr Johnson had “expressed himself in quite colourful language, but he hasn’t committed any offence and we need to be very careful about our handling of this because we believe in free speech in this country”. The Conservative Party has been accused of not doing enough to tackle anti-Muslim prejudice in its ranks, despite an initiative to boost tolerance and diversity. The independent panel will decide whether to refer Mr Johnson to the party’s board. Possible action includes suspension of membership or expulsion from the party among other, lesser sanctions. Protesters gathered in Mr Johnson’s constituency calling for his resignation. Conservative Party chairman Brandon Lewis and leader Theresa May have both called on Mr Johnson to apologise for his comments. And a hundred Muslim women who wear the niqab or burka signed a letter to Mr Lewis, calling on him to withdraw the Conservative whip from Mr Johnson and launch an independent inquiry into Islamophobia in the party. “We are not forced to make these clothing choices, nor are we oppressed,” the women wrote in their letter, which has been issued to the media by the Muslim Council of Britain. More than 30 protesters gathered in Mr Johnson’s constituency of Uxbridge, calling for his resignation. News of the Conservative Party investigation came as a watchdog which advises ex-ministers on taking new jobs ruled that Mr Johnson broke ministerial rules by taking up his weekly column at the Telegraph without consulting it first.